Brand new 2017 Gibson Custom Shop Les Paul Custom - Viceroy Gold Burst. Very rare, an investment opportunity Gibson Custom Shop guitar. Made from the finest tone woods mahogany body, maple top, mahogany neck and rare Maple finger board. This is one of very few on the planet, in fact the only one with a maple fret board. 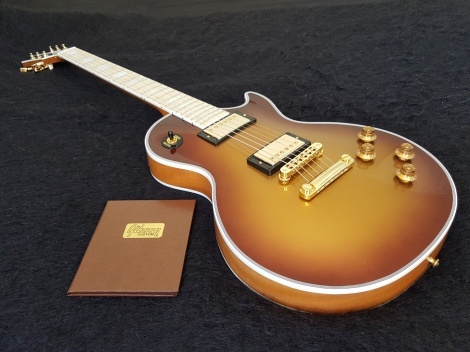 This Gibson Custom Shop Les Paul Custom guitar is a distinct and rare Made to Measure instrument. It was built in the Gibson Custom Shop factory where the materials were hand selected to ensure the highest standards of quality. Gibson, in their long history as a company, have created many exceptional instruments. This is one of those rare, exceptional and desirable guitars. Loaded with Custom Bucker pick ups as used in the Les Paul Standard Historic series. Gibson's best PAF yet for its hallowed chime, bite and growl. The warmth, rich, syrupy tone is amazing. The sustain is incredible with heaps of head room and no break up on distortion. The flashy Viceroy Gold Burst colour is unique and rare. The Gold hardware compliments the colour beautifully then highlighted with the stunning white Maple finger board.